Are you operating or starting out a small business? And at the end of the income year, you estimate that your trading stock’s value has not changed by more than $5,000? If those apply to you (especially if you are new to the business) you can choose not to conduct a formal stocktake. That way, you will not need to account for the changes in your trading stock’s value. 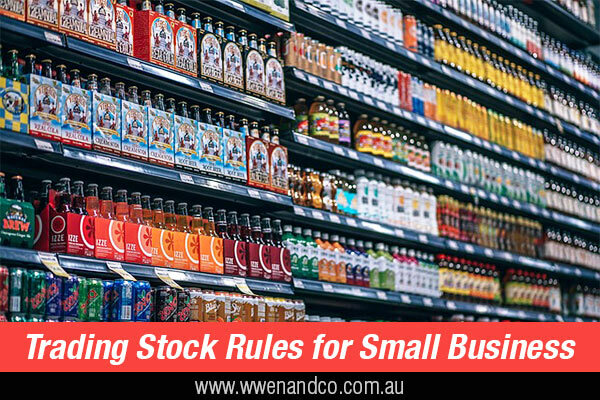 A small business will need to use the general trading stock rules if the difference in trading stock value has varied by more than $5,000. The general trading stock rules are illustrated below but ask us if you need further guidance. Another reminder in case you are new to business and tax — an increase in trading stock value over the year is assessable income, while a decrease is an allowable deduction. Again, ask this office for more details if you need them. You can choose to do a stocktake and use the general trading stock rules even if you are eligible to use the simplified trading stock rules. The value of closing stock is more than that of opening stock, your business must include the difference as part of its assessable income. The value of closing stock is less than that of opening stock, you can reduce the business’s assessable income by the difference. Id your business started operating during an income year, the total value of the stock on hand at the end of that year is included in assessable income. If your enterprise is in primary production and you slaughter livestock for your own consumption, it must be accounted for as though it was disposed of at cost.